You have many choices when it comes to ladies horse riding socks, like Tuffrider, Kerrits, Dublin, Coolmax, Exselle and more. Thermal, Argyle and microfiber socks in great horsey designs and equine motif. Technically designed riding socks meet the unique needs of the rider for comfort and support. Extra cushion on the bottom of the foot & Ankle Shield padding, fun NEW prints. Extra cushion on the bottom of the foot & Ankle Shield padding, fun NEW colors. Lightweight performance sock with heel to toe padding & arch compression, no sliding. Special compression mesh supports where you need it & left & right side arch-hugging band. Ankle Shield padding & extra cushioned foot bed, mesh panels for ventilation & no-slip top. 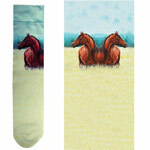 What a great paddock socks with a great horse design. Colorful Peace Sign Socks with Horses in motion all over them in neon colors. Cute as can be, soft & comfy child's socks with ponies in three great colors. Traditional horse socks in southwestern pattern in 2 colors. Traditional horses in motion pattern with horse shoes in navy and heather grey. Thornhill Argyle Boot Socks, soft and warm in large pink argyle or small diamond argyle. Adorable chains & charms with stars, boots, chains, horseshoes, horses and more on a white background. Thornhill Diagonal Socks, beautiful running horses pattern on a solid background, with diagonal stripes. Thornhill Grand Lesad Socks, beautiful rearing horses on a green background.